This policy pertains to the privacy of individuals whose data is collected by Crewhu while delivering services. This policy explains how we collect, process, and store such data. Crewhu obtains your data from companies, employees, and customers with which Cewhu has a legal or business relationship. Registration Data: When registering for our services, companies will provide us with information (such as, company name, individual name, company address, work phone number, mobile phone number and email address). Employee Data: For our customers’ authorized personnel to use our program, they are required to provide their first name, last name and email. Optional information collected includes employee birthday (month/day) and hire date. Customer Data: When using our Customer Satisfaction module, we collect customer company name, customer contact name, phone number, email, and customer feedback either through integration or through manual input. Cookies: Our servers may retain information in cookies about your session when you enter and use our service. Server Logs: Our server logs record system information when our service is used. Data collected will be processed in accordance with applicable law and regulations regarding data privacy. Personal data will be processed, stored and disclosed only for business purposes as described below. Cookies: To make Crewhu work even better for users, we also use 'cookies' to collect information about use of the website. Cookies are a feature of web browser software that allows web servers to temporarily store information within a user’s browser, which in turn allows us to recognize the computer used to access Crewhu. Most browsers automatically accept cookies, however, users can delete existing cookies. Aggregate Non-Identifiable Information: We use aggregate non-identifiable information to improve our service and to benchmark data. We use marketing tools to log when users view specific pages or take specific actions when using our service. This allows us to provide targeted marketing in the future. Email Marketing: You may receive marketing emails from us. You can always 'unsubscribe' or 'opt-out' of those emails within the body of the email. Legal Requirements: We may be required by law to disclose your information, and we will try to take reasonable steps to limit any such disclosure when legally possible. Service Providers: We will not disclose your data to any third parties except where necessary for the purposes of providing our service. We may disclose your information if required by any applicable law, subpoena, or regulation. We may also disclose your data to third party credit card processors and professional advisors acting on our behalf who are obliged to keep that data confidential. Change of Ownership: If we are acquired or otherwise sell our business, we will transfer all of your information to the successor entity. We only retain the data collected for as long as an account is active or otherwise for a limited period of time as long as we need it to fulfill the purposes for which we have initially collected it, unless otherwise required by law. We will retain and use information as necessary to comply with our legal obligations, resolve disputes, and enforce our agreements. We agree to anonymize or delete all the Personal Data and provide you documentation for such anonymization or deletion within a reasonable time following such termination and upon your written request. We follow generally accepted industry standards to protect the information submitted to us, both during transmission and once we receive it. We maintain appropriate administrative, technical and physical safeguards to protect data against accidental or unlawful destruction, accidental loss, unauthorized alteration, unauthorized disclosure or access, misuse, and any other unlawful form of processing of the data in our possession. However, no method of transmission over the Internet, or method of electronic storage, is 100% secure. We cannot ensure or warrant the security of any information you transmit to us or store on the service, and users do so at their own risk. We also cannot guarantee that such information may not be accessed, disclosed, altered, or destroyed by breach of any of our physical, technical, or managerial safeguards. If we learn of a security systems breach, we will inform users and the authorities of the occurrence of the breach in accordance with applicable law. We respect our users’ privacy rights and provide reasonable access to the data that users may have provided while using of our services. If users wish to access or amend any data we hold about them, or to request that we delete information about them that we have obtained, users may contact us as set forth in the “Privacy Concerns or Questions” section. At our customer’s request, we will have any reference to specific users deleted or anonymized. Users may decline to share certain data with us, in which case we may not be able to provide some of the features and functionality of our service. No Under Age 13: We do not intentionally gather information about users who are under the age of 13. Links to Third Party Sites/Services: Our service may contain links to other websites and services, which are owned and controlled by others. These websites and services have their own policies regarding privacy. Crewhu does not ensure or warrant third party site/services privacy practices and encourages users to review those policies. Revisions to this Policy: We may change this policy at any time, but we will notify you of any material changes to this policy. If you have any questions or concerns regarding this policy or Crewhu’s data privacy practices, please direct them first to privacy@crewhu.com, or to 5301 Taylor St, Hollywood, FL 33021 Attn: Privacy. 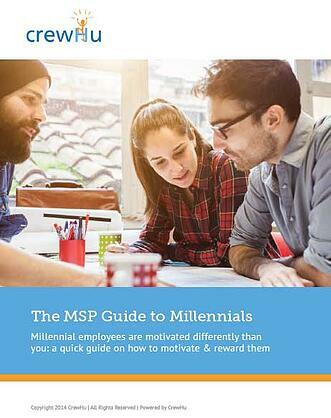 Learn the secrets to inspiring and connecting with millennials.